The characterization of biomolecular interactions is essential for modern drug discovery. Surface plasmon resonance (SPR)-based biosensor technology offers a great flexibility in which type of target it can be applied to and covers a wide range of applications from small molecules, peptides, proteins, antibodies, nucleic acids, membranes to whole cells and viruses. SPR biosensor-based assays are well suited to overcoming many of the limitations of traditional binding assays. SPR detection methods eliminate the need to label reagents, thereby avoiding the risk that the label may interfere with complex formation or radioactive disposal. Importantly, SPR analyzers are able to monitor complex formation in real time and therefore can be used to resolve a number of kinetic and thermodynamic parameters and mechanism of an interaction. 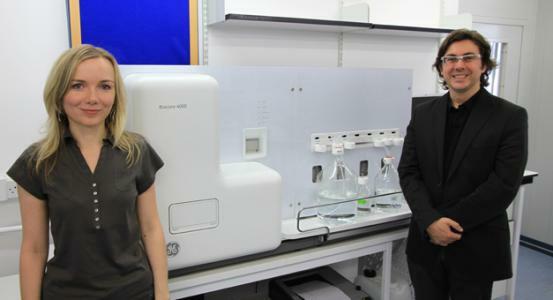 We are one of best equipped academic SPR labs in the UK. We have access to a BIACORE 4000, 3000 and T100. If you are interested in academic collaborations please contact Iva Navaratilova. We have also spun out a company, Kinetic Discovery, to offer contract research services in biosensor screening to the pharmaceutical industry.